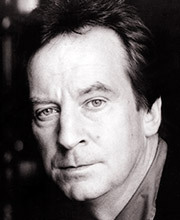 Born in Glasgow in 1945. and founder member of 7:84 Theatre Company, Bill Paterson was involved in many of the first productions of John McGrath, John Byrne and Billy Connolly. He has worked extensively in theatre – Who’s Life Is It Anyway?, Guys and Dolls, Death and the Maiden; on TV – Smiley’s People, The Singing Detective, The Crow Road; in film – The Killing Fields, Truly, Madly, Deeply, Richard III and Spiceworld. His radio work has included many dramas and documentary commentaries.